How do you manage to go to the lavatory wearing that kind of outfit? This is a familiar question which most of Jumpsuit lovers face all day every minute. But who minds stripping everything when nature calls just for a few minutes and slay for the entire day? There is no shortcut, everything beautiful has its flaws and cons. Jumpsuits have been in existence since time immemorial. I remember as a small gal I had several pieces in denim texture(Dungarees) but at that point I never knew nothing about fashion. Coincidentally I bet it’s a mothers’ intuition, my daughter has her share of the same which ranges from pajama jumpsuits, Rompers and casual play-suits. Dressing up sometimes can be daunting, demanding and exhausting. We wish for that convenient one-piece apparel you can pull without having to ensemble or layer it with anything else. What you see in my pictures today is a perfect definition of a convenient easy outfit which requires only ironing. If I were to pull a corporate look with this a jumpsuit, I would just add a blazer or a sweater. Second, change my strapped shoes to closed official shoes and Voila…. Perfect corporate look. Timeless…Check! Versatile…. Check! convenient…check! Affordable…….7$ or 700.ksh Double check!! !Chic and edgy confirm with its unique Polka-dot style. These are some of the reasons that will make me a repeat offender of this precious apparel in 2017.
hahahah the lavatory question is one I often get whenever I wear jumpsuits to the office. Love this dear. Elle dear I can totally relate…but i just smile and tell them i don’t mind stripping. Wow! Looking good gal…I love the jumpsuit. 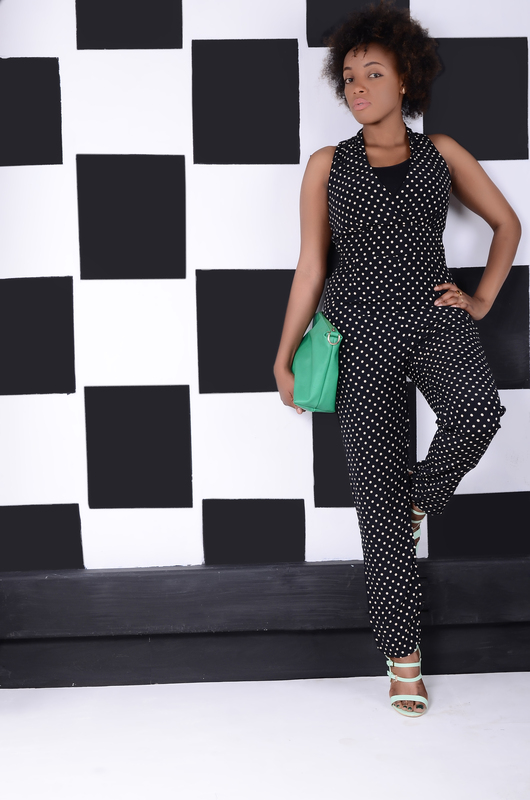 I love anything polka dots..This jumpsuit is classy!Looking absolutely stunning. Thankyou Lynda…I totally agree with you. Thank-you dear…Great week ahead too. Thank-you dear…yes a time is coming very soon. Very true Wanjiku…I agree with you. Fell in love with this jumpsuit on insta! You look so chic and amazing! I love jumpsuits and yours is so chic! The polka dot print is so cute! Jumpsuits are always tricky!But if its cute i don`t mind taking the extra hustle when mother nature calls! This is the price of being beautiful! Thankyou Winnie… i totally agree with you.The price has to be paid to look great. Tem razão, não é fácil ir ao banheiro com uma peça dessa. Mas é lindo o seu macacão e vale a pena. The question was well answered. I totally agree about the dressing process and am glad there are wardrobe staples that make the process easier. I love the makeup, it’s simple and speaks elegance just like the look.